"I challenged my NT colleagues to designate one passage from any one of the four Gospels giving clear evidence of a date later than 50 A.D. . . . The challenge was not met, nor will it be, for there is no such passage." - C. C. Torrey, professor of Semitic Languages at Yale from 1900 to 1932. The atheist groups are proselytizing unbelief again. This year, one group's seasonal billboards will blaze out beside highways in Florida, Ohio, and the New Jersey side of the Holland Tunnel the message that Jesus is a myth, just like the Roman god Neptune. American Atheists has spent money for several years now on anti-faith billboard messages. The group announced on Monday its theme for the season - that Jesus is a myth. One billboard in Florida, for instance, will show pictures of both Jesus and Neptune crossed out and a caption that says, "2 Million Floridians don't believe in gods." Another shows pictures of Neptune, Jesus, Santa Claus and Satan under the headline, "37 Million Americans know MYTHS when they see them." American Atheists is not alone. The trend of calling Jesus a myth (read "non-historical" or even "non-existent") has run along the west side of the United States too, albeit a bit badly. 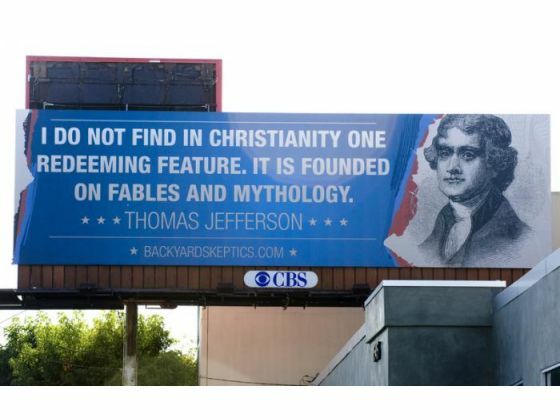 An atheist group called Backyard Skeptics got drubbed in late October for wrongly attributing a skeptical quote to Thomas Jefferson. The group paid to put up a billboard of a picture of Jefferson along with the quote, "I do not find in Christianity one redeeming feature. It is founded on fables and mythology." The Jefferson Library (which should know) has said it gets queries about this quote from time to time, but has no knowledge of a letter to a Dr. Woods, nor of the existence of the quote in any of Jefferson's writings. Bruce Gleason of Backyard Skeptics accepted Monticello's authority on the matter. "You're absolutely right," he said. "I should have done the research before I put my billboard up." The real issue, of course, isn't about Thomas Jefferson's opinions. The issue is that Jesus Christ's existence has a great deal more substantiation than the god Neptune's. In the strict, literary sense of the word, a myth is a sacred narrative explaining how the world came to be as it now is, according to the traditions of a particular culture. Myths are stories that are often believed by the cultures that hold them, whether that belief is justified or not. The connotation of the atheistic billboards is that, "These are all beings that don't really exist." Contrary to the atheists' billboarded view, Jesus' historical existence and significance is one of the best, if not the best, documented in the ancient world. There are thousands of New Testament manuscripts in existence, some of which date back to the First and Second Centuries A.D. The epistles of Paul are all down-to-earth letters that circulated to the followers of Jesus of Galilee whose fame the people of the First Century Mediterranean knew. Popular 19th and 20th century scholarship assigned late dates to the gospels and questioned their historical value, yet more recent scholarship has ridiculed those late-date claims as unfounded. There's little room to cover the extent of the arguments here, but as a small example, Biblical criticism and archeology have risen to the defense of John's gospel, which has long been dated later than Matthew, Mark, and Luke. "That which was from the beginning, which we have heard, which we have seen with our eyes, which we have looked upon, and our hands have handled, of the Word of life." "This is the disciple which testifieth of these things, and wrote these things: and we know that his testimony is true," (John 21:24). While liberal in his theology, New Testament scholar John A.T. Robinson argues in his book Redating the New Testament (1976) that the gospels, including John, were written prior to the Temple's destruction in A.D. 70. Among other arguments, Robinson points out that in John, Jesus and the disciples visit locations that can be identified and followed in a sequence that it is possible to reasonably retrace on the ground. Archeologists located the Pool of Siloam in 2004, as John had described. Henry Wansbrough says in "The Four Gospels in Synopsis" in The Oxford Bible Commentary, "Gone are the days when it was scholarly orthodoxy to maintain that John was the least reliable of the gospels historically." Those who reject the nature of Jesus as the Son of God, who question his very existence, reject the most powerful story of sacrifice and love every told. Jesus came to deliver us out of the authority of darkness and bring us into His kingdom of Love. Jesus, who knew no sin, became sin (2 Cor. 5:21) and gave His Life so that we could be reconciled back to the Father, as foreshadowed and foretold in the Hebrew scriptures. We have been given the authority and the power to overcome the enemy and be trained as His companions to rule and reign with Him. The atheists might clump Jesus up with Neptune, but it's an empty, weak effort. Jesus is not merely a myth. He lived, died, rose again (1 Cor 15:1-9), and continues to touch and heal people to this day, of which we are witnesses. Oh, and technically, Satan and Saint Nicholas are both real too.